Located in northwest Montana, Whitefish Mountain Resort is on Big Mountain – perfectly named. This big ski resort is among the most beautiful we have ever skied, with views of Glacier National Park’s snow ghost peaks and the magnificent Canadian Rockies, plus Flathead and Whitefish Lakes. Whitefish Ski Resort is cool and pretty convenient, 6 miles from the fun western ski town of Whitefish, just 20-minutes north of Kalispell. The ski resort is now called Whitefish Mountain Resort, but many skiers till call it Big Mountain – its original name since it opened for skiing in 1947. Whitefish Mountain Resort is indeed a big mountain, with 3,000 acres of skiing in every direction off the panoramic 6,817’ summit. Whitefish is un-crowded, incredibly scenic and affordable – compared with other western ski resorts. With 300 inches of snow annually on the 2,353’ vertical of vast acres of bowls, chutes, and glades on all aspects, stunning mountain and lake scenery and a great ski town, Whitefish quickly moved into our Top Western Ski Resorts. Locals use the slogan “Ski the Fish” – since Whitefish’s renaming in 2007 to embrace the great ski town of Whitefish and Whitefish Lake below Big Mountain. Whitefish ski resort offers a friendly fun-loving vibe, tons of terrain on all four sides served by 3 high speed quads and six triples, and virtually no lift lines, at very good value for your ski dollar. You’d be hard to pressed to find two more scenic, superb 2,000’ vert trails with consistent pitch than Inspiration and Toni Matt– named for the 10th Mtn Division skier who headed up the ski school here. Moe Momentum is another signature long lovely trail named for local Gold medal racer Tommy Moe. 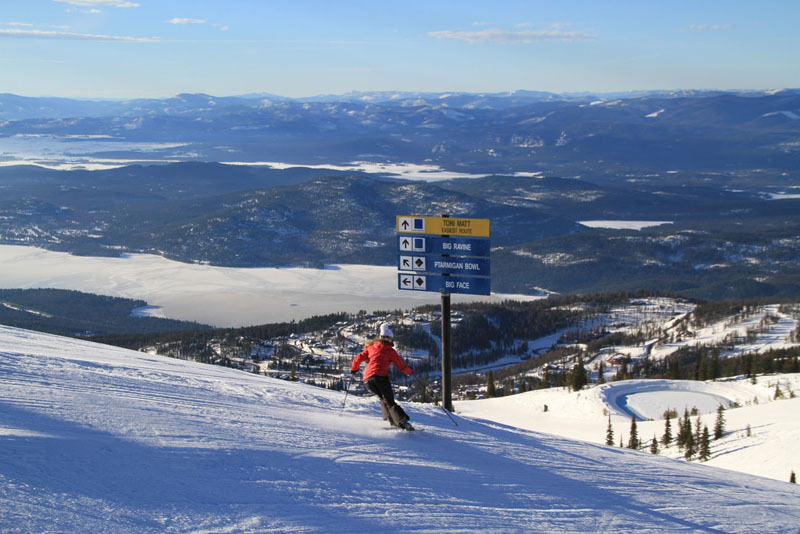 All Whitefish front side runs are south facing in the sun (when its sunny at 48N), including wide open Ptarmigan and North Face Bowls, with sweeping views of Whitefish Lake, and the Flathead Lake valley (the largest fresh water lake in the west,). From Big Mountain’s summit you can see the majestic white peaks in Glacier National Park and the Canadian Rockies, before you drop over the North Side to Big Creek and Flower Point for more glades, groomers and protected snowy stashes. Finally, there’s backcountry skiing in- bounds in 500-acre Hellroaring Basin – all natural steeps, Glory Hole glades, and Picture Chutes reached via Hellfire traverse. If that’s not enough, Whitefish has night skiing on weekend nights and peak holidays, on Chairs 2, 3 and 6 until 8:30 including the Fishbowl Terrain Park. But we think après ski at Whitefish is the better choice with great bars like the Beirstube and Hellroaring Saloon, plus the classic western ski town of Whitefish just down the road. For ski in ski out lodging, Whitefish Mountain Resort’s Village has the perfectly poised Morning Eagle Lodges with condo-style suites, equipped with kitchens, laundry, a 5th floor rooftop hot tub, and ski lockers steps to the slopes, plus underground parking and elevators. From your condo, you have a view of the ski trails or the Lake, and you can easily walk to the Hellroaring Saloon, Ed & Mully’s, Cafe Kandahar and the Bierstube for après ski and dinner in Whitefish ski village. In downtown Whitefish, a truly authentic western ski town with great boutique shopping, family friendly pubs and cafes and a great local vibe, there are a dozen in town hotels and lodges like the Grouse Mountain Lodge and the 4 star Lodge at Whitefish Lake. Besides big mountain skiing at Whitefish, there is a much exploring to do in downtown Whitefish, go snowmobiling, watch the ski joring during Whitefish Winter Carnival, go dog-sledding, ice skating at the Stumptown Ice Den, or go visit Glacier National Park – just 19 miles North.